This topic was published by DevynCJohnson and viewed 957 times since " November 07, 2015 @ 20:33UTC ". The last page revision was " January 13, 2016 @ 10:59EDT ". "Program-Analyzer" is a GTK3 GUI that provides a visual interface to some of the GNU-binutils such as "objdump". With this program, developers can right-click an executable or library and open the binary with Program-Analyzer. 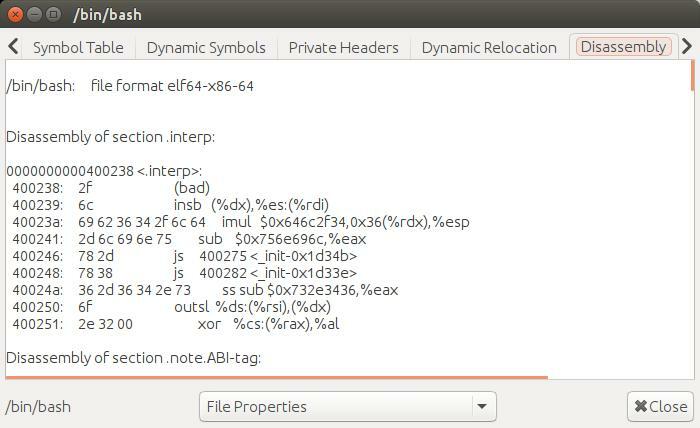 The analyzer will then display symbols, disassembly, file information, and more about the chosen binary file. The minimal requirements are Python3, GTK3, PyGObject, and GNU-binutils. "Program-Analyzer" is licensed under LGPLv3 and is made by Devyn Collier Johnson <DevynCJohnson@Gmail.com>. NOTE: A minor bug was fixed (the program did not appear in "open-with" on some distros).